We all know that it can be incredibly boring trying to keep your teeth clean; I mean, that’s why we all left home, right? The last thing that we want is that nagging voice in our ears that sound all too similar to our mothers, telling us to eat our five fruit and veg a day, and to walk instead of getting the bus, and to make sure that laundry is done before we go out . . . But if we’re totally honest, the reason that our parents nag about that sort of stuff is, well, because they’re right. It is good to eat fresh food, and walking is better for you (and cheaper!) than getting the bus, and it’s a lot nicer to get home and collapse into bed when there is fresh linens in there. But when it comes to brushing our teeth, apparently loads of us still don’t follow the basic rules which are basically life hacks to make sure that we can still enjoy our teeth when we’re 60. We caught up with Dr Paige Woods, an awesome dentist who has set up her dental practice in San Diego, to find out her top five hacks for keeping your teeth healthy. Yup, that’s twice a day for two minutes at a time. You should be spending at least four minutes of your day brushing your teeth, which isn’t actually that long when you come to think about it. Find it difficult? Play an app that has a timer, and you’ll soon be amazed at how quickly two minutes can go by when you’re not thinking about it. You may hate floss, but floss loves you. 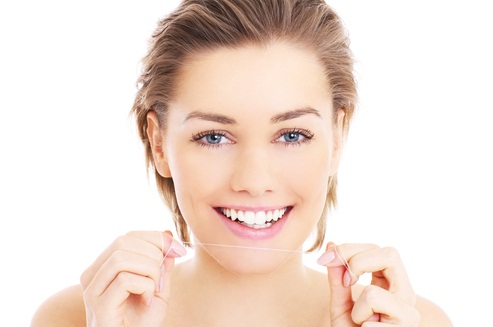 The best way to ensure that you can keep your mouth as clean as possible – which greatly reduces your chances of getting gum disease – is to floss. You don’t have to do it twice a day, but once a day every day is a pretty good rule to go by. Did you know that when you eat is almost as important as what you eat? The longer that you leave sugar on your teeth before you brush them means the longer the acid in the sugar has to destroy your teeth. That’s why dentists recommend that you only have sugary foods once a day, and then brush your teeth about 30 minutes after. If you want to keep your teeth for as long as possible, then make sure that they are protected when you’re playing contact sports like football. Having a mouth guard won’t cost you too much in concentration, but it can make all the difference after a heavy tackle, and no one likes the toothy look. We all know this one, but how many of us actually go? It is vital, says Dr Paige Woods, that we all go and see our dentist at least once a year for a general check up, even if we don’t think that there is actually anything wrong. This is because there could be problems underneath the surface that we’re not aware of, and only a dentist will be able to tell – and will be able to do something about it before it gets too bad. Heard of some of these already? Perhaps it’s time to give your mother a ring and thank you for raising you so well – and promising her to keep following these awesome hacks!